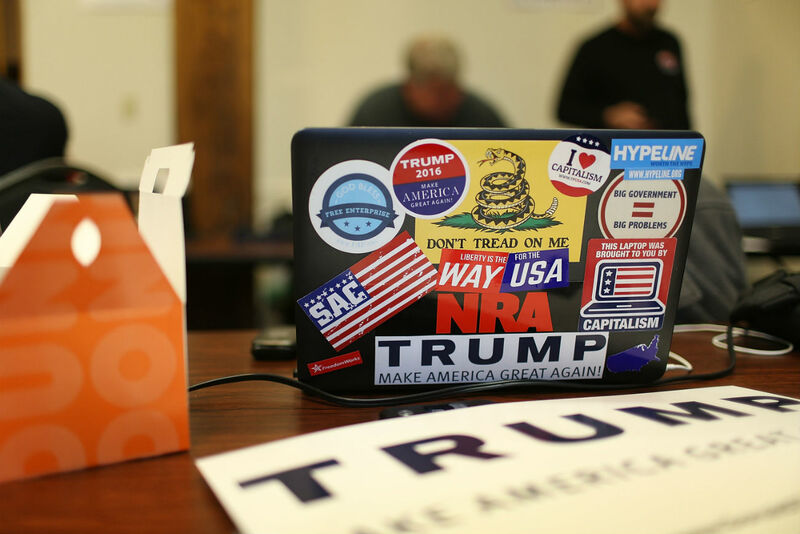 A computer is covered with stickers as volunteers call people asking them to vote for Republican presidential canddiate Donald Trump. The flawed report by U.S. intelligence agencies the CIA, FBI and NSA on allegations that Russia hacked computers to help Donald Trump win the presidential elections raises a broader issue. Will the new resident of the White House get briefings good enough on which to base responsible foreign policy decisions? The surprisingly hollow declassified report by the Office of the Director of National Intelligence (ODNI), apparently intended to prove Vladimir Putin’s personal interference in the U.S. presidential election, should be a cause of genuine alarm for the Russian leadership. Despite a natural gift of intuition and experience in doing business, Donald Trump, by all counts, is a neophyte in the complicated world of diplomacy, foreign policy and national security. As a matter of fact, some of his counterparts, like British PM Theresa May are reported to count on this, hoping to fill in the void by attempting to provide him with guidance and give direction. Yet, on a routine daily basis the quality of judgment and instructions that President Trump may pass to the U.S. State Department, Defense Department and the intelligence community would depend on the competence of counselling and memos by professionals in these three fields. The intelligence community experts who put together the report focused on Putin’s assumed ‘bad’ intention to welcome Donald Trump (who regularly made conciliatory gestures wishing to improve relations with Moscow) instead of Hillary Clinton who swore to introduce a no-fly zone in Syria – which could have been interpreted as an act of aggression, setting the stage for a possible direct confrontation between Russian and American air forces in the region. Surprisingly, seven out of the 13 pages of the ODNI report refer to broadcasts by Russian state-funded international TV channel RT and tweets by supposedly pro-Kremlin Internet trolls to prove that these media tools were used to “intensify” critical coverage of Clinton’s campaign. Strangely, no one seems to have done basic fact checking: an RT programme, Breaking the Set, mentioned in the report, went off air in February 2015, and could hardly affect developments in 2016. In sum, the ODNI report is an epic failure. Even The New York Times lamented the absence of firm evidence. A tsunami of ridicule that rippled out on social media platforms was so disrespectful that it reactivated speculation among Russian bloggers that the President-elect would be forced to do something about the deplorable state of the intelligence community. Nascent experts in international affairs and intelligence set out on the road to becoming seasoned professionals at high school or college. Yet, according to a July 2015 report by the Pittsburgh University-based Association For Slavic, East European, And Eurasian Studies (ASEEES), dated July 2015, enrolments for Russian language courses in the U.S. dropped 18 percent between 2009 and 2013. In June 2016, the Humanities division of the University of Chicago laid off staff teaching Slavic languages and literature. This could be a rather disturbing trend. One of the most likely reasons why the authors of the ODNI report blurred fact and fiction is a growing deficit of knowledgeable operatives with a good command of the Russian language and a solid insight into what is happening inside Putin’s Russia, including an understanding of the mood of the people and the values they hold. Competence in governance is not something that you define as “like-to-have” but as “need-to-have” to ensure the quality of managerial decisions. Lack of experts and expertise cannot be substituted by brainstorming of diligent but half-baked sub-prime personnel. Naturally, this “desire” encounters opposition. In this battle no holds seem to be barred. However, the admission that things have gone wrong emerges as surely as water flows down a hole. Take, for example, the hard-won revelations that William J. Burns, president of the Carnegie Endowment for International Peace and a former Deputy Secretary of State who served as U.S. ambassador to Russia from 2005 to 2008, shared with The New York Times. If future regular intelligence recommendations and briefs are sustained at the same intellectual level and are as fact-based as the ODNI report, the White House, as a smart New Yorker would warn, is in for a big trouble, or to be more correct, in for big tsuris. Like it or not, the competence of the American intelligence community is one of the pillars of global security, or insecurity, as illustrated by the faulty assertions that Saddam Hussein had weapons of mass destruction. This apparently internal matter is not simply another headache for the new occupant of the White House, but a vital concern not only for the U.S. as a nation, but also for Russia and the rest of the world. Moscow has a stake in America's intelligence community providing the 45th President of the U.S. with fact-checked, balanced and unbiased analysis of whatever is going on in the outside world. Only with such accurate, objective information, can the leader of the world's singular superpower make if not necessarily wise, at least responsible decisions that affect millions, no – billions of people. Vladimir Mikheev is a freelance commentator for Russia Beyond The Headlines. His opinion does not reflect the position of RBTH or its staff.